Since this month’s #TwelveLoaves challenge is all about summer herbs, I decided to make a quick bread that I’m calling “Thyme for Beer Bread” which uses plenty of fresh garden thyme which I snipped right from our own backyard herb garden. If you’re a fan of beer bread but have always made it out of those packaged box mixes…give it up and try making it from scratch! You’ll be amazed at how fast and easy it is to prepare and that it seriously takes about the same time to make a fresh homemade beer bread than it does to open up that silly box. -Spray a 9×5 loaf pan with cooking spray. -In a large bowl, whisk together the flour, baking powder, salt, garlic powder, thyme leaves and sugar. -Pour in the beer and 3 tablespoons of the melted butter. Stir with a spoon until just combined and a stiff batter has been formed. -Scrape the batter into the prepared loaf pan and spread the batter as evenly as possible in the pan. -Brush the top of the loaf with the remaining 2 tablespoons of melted butter. -Bake in a preheat oven for 45-50 minutes or until the loaf is a lovely golden brown in color and when a toothpick inserted in the center comes out clean. -Turn the loaf out onto a wire rack and cool completely before slicing. #TwelveLoaves August: Summer Herbs. The month of July was all about breads and Summer Fun! We have chosen Summer Herbs for our August theme. Let’s share flat breads, rolls, buns, grilled breads-whatever sweet or savory version you’d like and whatever you feel reflects summer flavors! Whatever you bake, (yeasted, quick bread, crackers, muffins, braids, flatbreads, etc) have fun and let’s have a delicious month of bread for SUMMER HERBS! Let’s get baking! This month our hostess is Sherron from Simply Gourmet. 3. 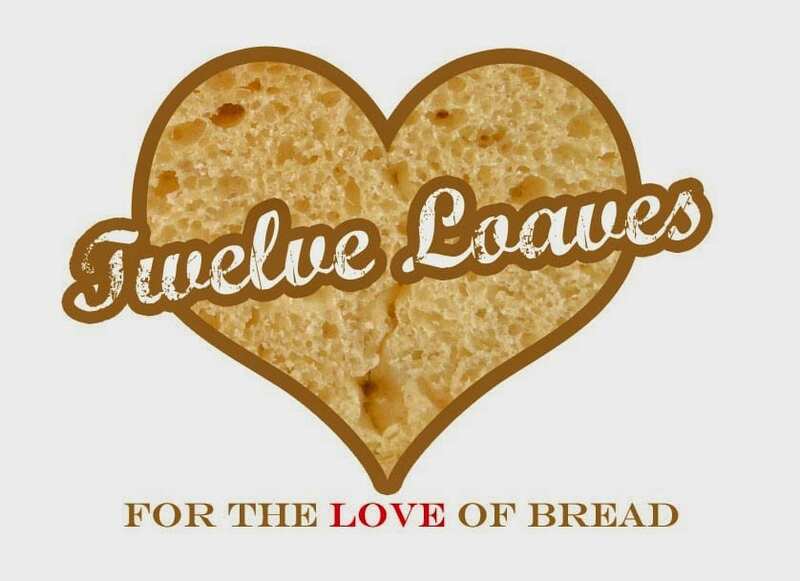 Have your Twelve Loaves bread that you baked this August 2014, and posted on your blog by August 30, 2014. #TwelveLoaves runs smoothly with the help of our friends. Thank you to Sherron from Simply Gourmet for hosting this month’s event! I'm just thinking about all the flavor possibilities with this bread using different beer and herbs. Fabulous! Oh, what a lovely loaf of bread and I love the title. 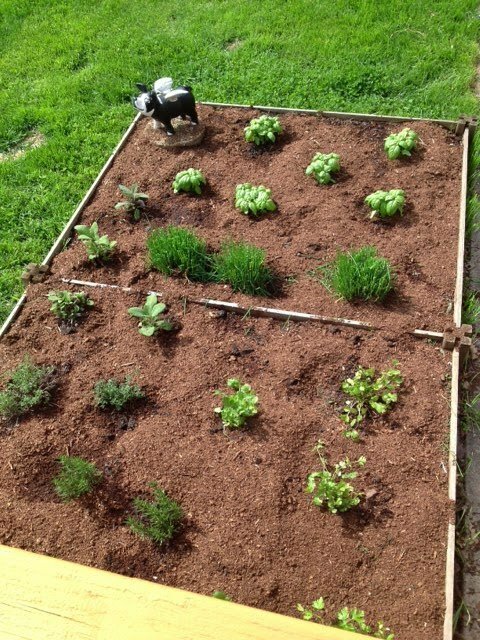 My husband would say it is always "thyme" for bread and beer…LOL I am jealous of your little herb garden. I can grow vegetables but struggle with herbs. Good luck with the drying–I will be interested to know how that turns out. Thyme and beer: wow. You really surprise me. I really want to try that combination in bread. It's always time for beer bread! It came out beautifully, Renée, and I am so jealous of your herb garden. It's so hot here right now that mine are dried already, right on the plant. I have to start again in the fall when it cools off. Such a cute title! Your beer bread looks scrumptious! Love your herb garden! I am the plant black widow. Black thumb doesn't begin to define me. I love herby breads. This thyme and beer situation is right upto my alley! 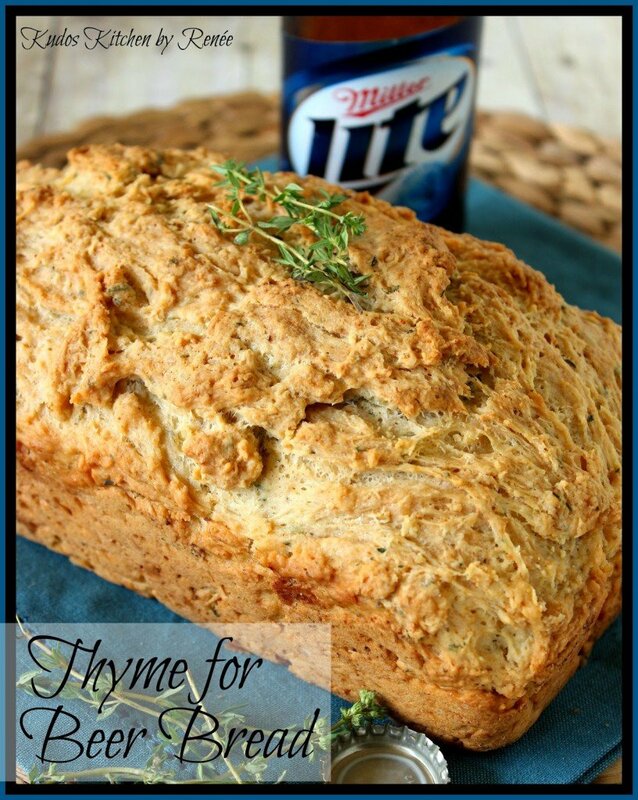 Thyme for bread is the best title …ever:)) LOVE your herb garden and this fantastic beer bread for our August theme!! 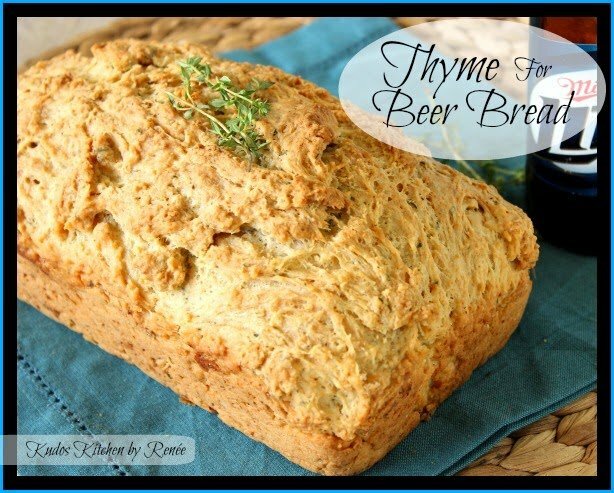 I love making quick breads and what could be better than beer and thyme! Delicious! 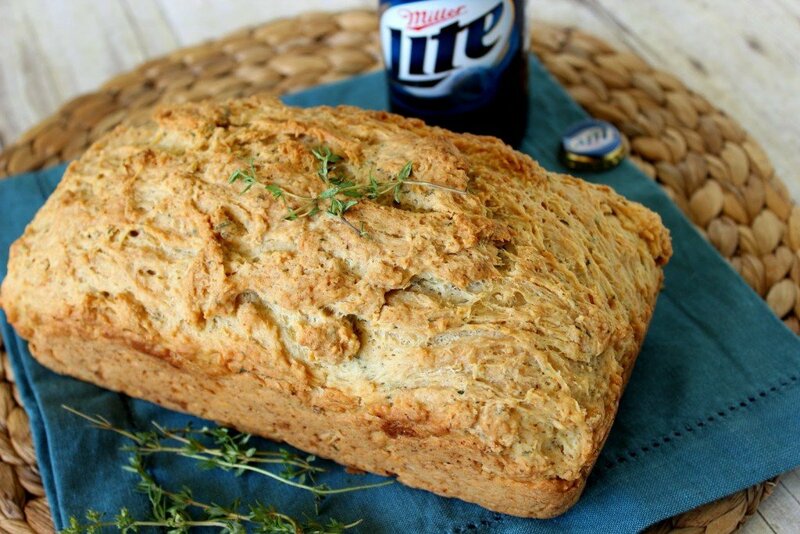 I adore beer bread … and this one sounds fantastic! I also adore the title of your bread … so clever and cute! I know exactly what you mean by those darn weeds. You garden looks great and your beer bread looks fantastic! Your bread looks awesome! So how beer-y is it, asks the non-drinker (it's a taste thing. I'll cook with alcohol since a lot of it burns off but I hate the taste otherwise)? If it's more like "beer" than "BEER!" I'd love to give it a try. And I'm terribly jealous of your herb garden, overgrown and weedy or not. MY herb garden, on the other hand, comes from the grocery store, except for one rosemary that's on life support. I love your herb garden! And this bread looks fantastic! I'm pretty jealous of your herb garden, and the fact that you have a vegetable garden too! Your bread looks tasty! Can you come help with my herbs? I know they are probably dying because they are all indoors but it's so sad! Half my thyme is dead and well the rosemary is beyond repair. Love the sound of the thyme in this bread by the way! We adore beer bread! Thomas can't get enough! We'll have to try this version! Such a cute garden. I bet that even overgrown it is such a joy to have herbs in your yard. I want to have an herb garden next year and make this bread for sure! Beer bread is SO versatile. Love the addition of the herbs. Thanks for sharing with #twelveloaves.